As anyone who has ever done archival research knows, there are moments where things can get incredibly dull. To get over this, we all try to find little things that keep us going. When I was in the midst of reading every issue of the Moose Jaw Times between 1931 and 1934, for example, I very much enjoyed following the daily exploits of Little Orphan Annie. Most days nothing noteworthy happened – in fact, some strips were simply announcing that she was changing locations – but it all worked together as a serial and, every couple weeks, something exciting happened that made you glad you had followed the story all the way through. When compared to today, where people binge television programs, the long-term connection and slow unfolding of story lines over the course of weeks and months seems to have been lost. One place where binge consumption isn’t as prominent, however, is comics. Just as it took Annie a couple weeks to resolve a problem, comic strips today still evolve at a slower pace than other forms of entertainment. There are plenty of daily comic strips that still operate as a serial, serialized comic books release a new issue every few months, and even graphic novels, while not always serialized, have a tendency to allow stories to unfold at a slower pace. Because of this, comics have distinguished themselves as a form of popular culture. Through their unique ability to tell stories, they have often been able to illicit strong emotional reactions from readers. And while there are plenty of examples of comics being subversive, they have not received the same attention from censors or law makers as film, television, and music, meaning that through the twentieth century they were able to operate in a less regulated environment and regularly presented narratives that may not have made it into mainstream popular culture. 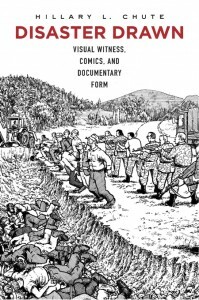 This is particularly true of depictions of war, which is the subject of Hillary Chute’s new book Disaster Drawn: Visual Witness, Comics, and Documentary Form. In this episode of the History Slam, I talk with Professor Chute of the University of Chicago and Visiting Professor at Harvard University about the book. We chat about the perception of comics as a medium for children, the tradition of subversive comics in American history, and comics in the digital age.